Email sent to Dr. Daniel Griffith's colleagues at the University of Texas, January 29, 2008, explaining that they have a unique responsibility to correct the disinformation that Griffith has been feeding the public about the Mecca orientation of the crescent. Crescent of Embrace publicity photo (left). Wikipedia’s “typical” Islamic crescent and star (right), colored red and viewed from a similar angle. 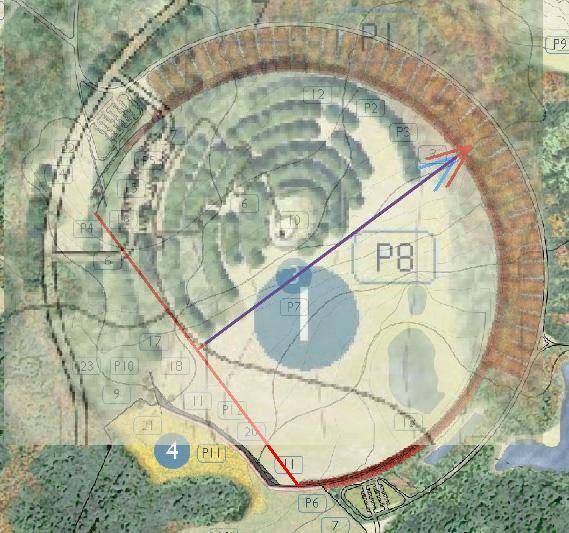 The copse of trees that sits roughly in the position of the star on an Islamic flag marks the Flight 93 crash site. 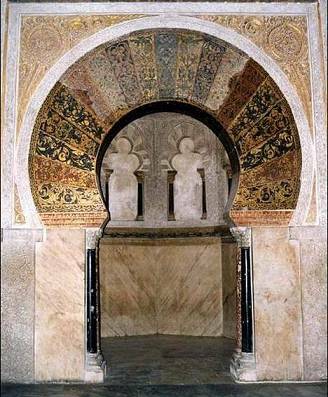 The mihrab of the Great Mosque in Codoba Spain. Face into the crescent to face Mecca. You can also think of the Crescent of Embrace as a giant Muslim prayer rug (called a “musalla,” which translates into English as “small mosque”). Neither was Griffith misquoted. Kirk Swauger of the Johnstown Tribune Democrat also talked to Griffith. “He said you can face anywhere to face Mecca,” Swauger told me over the phone. Griffith studied Rawls’ assertions for Families of Flight 93. [He] said the geometry used for a sphere such as the earth is different than the geometry for a two-dimension surface, which Rawls is using as the foundation for his arguments. I have no idea why Professor Griffith is propagating this disinformation. Does he have some personal connection to architect Paul Murdoch? Does he think he is helping the grieving families of Flight 93 by telling them what he thinks they want to hear? Whatever his motivation, he is covering up the truth and protecting an enemy plot. I see from Griffith’s web-page that he is actually an economist (my own background) rather than a GIS person. Unfortunately, he has that GIS credential by his name, and there are very few GIS professors in the country who can be appealed to for equally credentialed counter-expertise. As far as I can tell, the only GIS departments in the country are at UT and Oklahoma State. I am sending this appeal to professors in both departments. Professor Griffith’s deceptions must be publicly corrected by your departments. It sounds crazy that a professor could tell the press that there is no such thing as the direction to Mecca and be believed, but this is in fact the state of affairs. Griffith is also deceiving the Park Service, and the Flight 93 family group. There are a host of geometric claims about the crescent design that need to be fact checked and publicized. Griffith’s deceptions have stopped all of this from proceeding. 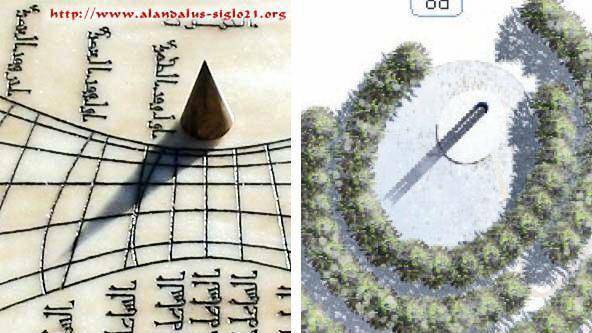 The Tower crescents are turned exactly 90° to the central crescent (where it is the bisector that points just north of Mecca). Red and blue make purple. The two orientations are identical, as closely as can be determined given the pixel resolution of the graphics. 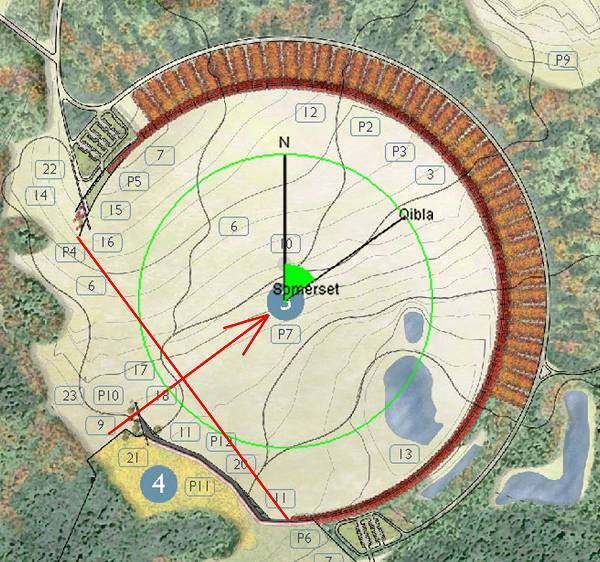 The design included numerous other proofs of intent as well, including repeated exact Mecca orientations. The design is also replete with terrorist memorializing features. We hosted an open design competition in time of war. Of course we should have expected that the enemy would enter and try to win a memorial to their heroes instead of ours, which is exactly what happened. The Crescent of Embrace is a terrorist memorial mosque. 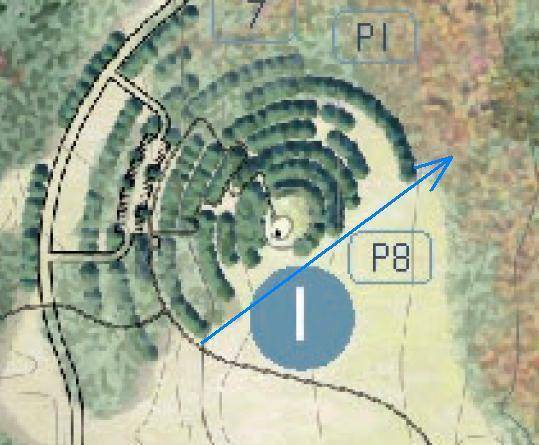 Initial uproar over the bare naked crescent and star flag forced the Memorial Project to disguise the crescent with a few irrelevant trees, but every particle of the original crescent design remains completely intact in the so called redesign. This al Qaeda sympathizing plot is succeeding, largely due to the efforts of your colleague Daniel Griffith, and you are some of the only people in the country who can overcome his malign influence. Please fact check my information, and help me stop this enemy attack on our country. Any of you who are willing to fact check any of my claims about the memorial, please contact me.